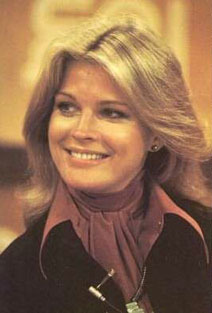 Candice Bergen played the title character on TV's Murphy Brown. She won five Emmys in the role, playing a smart, ballsy TV reporter whose work often reflected issues in the news. In 1992, she was caught up in controversy when American vice president Dan Quayle criticized Bergen's TV character for becoming a single mother on the sitcom. In a noteworthy 1997 episode, Murphy, undergoing chemotherapy, smoked marijuana to ease her pain. Bergen is the daughter of Edgar Bergen, a ventriloquist, and Frances Westerman, a model who posed for billboards advertising Chesterfield cigarettes. As a child, Bergen was jealous of her father's famous dummy, Charlie McCarthy -- the room where McCarthy and his props were stored was bigger than her bedroom. For a time, she and the dummy had matching pajamas, which, Bergen has said, "felt strange", and it stung when reporters mentioned her as "Charlie McCarthy's little sister". Her father was at his peak of fame during Bergen's childhood. Frequent houseguests included Jimmy Stewart, Walt Disney, and Ronald Reagan, and Bergen's playmates included the children of such luminaries as Gregory Peck and Judy Garland. Predictably, she became something of a wild teenager, and she was eventually booted from college for lack of interest in her studies. She was cute enough to find easy work as a model, and inspired by famed Life photographer Margaret Bourke-White, she also worked on the other side of the camera. Bergen was already semi-famous as a model when she began acting on a lark, after director Sidney Lumet asked her to play the icy lesbian in The Group with Joan Hackett. As Bergen became better known as an actress, she continued working as a photographer, and eventually used her fame to garner prestige assignments. In her most famous work as a photographer, she shot Charlie Chaplin for a Life magazine cover. As a film actress, she starred with Jack Nicholson and Art Garfunkel in Carnal Knowledge, played the missionary in The Sand Pebbles with (ambiguous link, Steve McQueen), and she played her hero, the photographer Bourke-White, in Gandhi with Ben Kingsley. At 33, she married film auteur Louis Malle, and they spent much of their marriage living in France, but unlike many movie couples they never worked together. After Malle died of cancer on Thanksgiving Day in 1995, Bergen spent years battling insomnia, anxiety, and grief. She has said she was definitely not looking for romance when, three years later, friend and 60 Minutes producer Don Hewitt introduced Bergen to the man who would be her second husband, real estate tycoon Marshall Rose. In the 1960s, young Bergen shared a house in Southern California with songwriter Terry Melcher. When they moved out, Sharon Tate moved in, and it was in that house where Tate was eventually murdered by followers of Charles Manson.